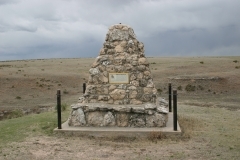 The Battle of Punished Woman's Fork (14SC306) is a site that was the location of a confrontation between the U.S. Army and a group of 284 Northern Cheyenne on September 27, 1878. The Northern Cheyenne, under the joint leadership of chiefs Dull Knife and Little Wolf, had left the Darlington Agency in Indian Territory (present-day Oklahoma) earlier in September and were attempting to return to their homes in Montana. A detachment of U.S. Army soldiers under the command of Colonel William H. Lewis, who had orders to capture and return them to Oklahoma, was in pursuit. The Cheyenne stopped in a narrow tributary of Ladder Creek, known today as Battle Canyon, where they prepared an ambush for the approaching soldiers. After a protracted gun battle during which both sides suffered casualties, the Cheyenne were able to slip away and continue their flight to the north. The soldiers continued their pursuit until most Cheyenne were killed or captured. The clash that took place at the Scott County site between the Cheyenne and the U. S. Army, and their ultimate escape to continue their journey north toward Montana was a pivotal event during the larger Northern Cheyenne Exodus of 1878-1879. This nationally significant site was nominated for its association with this event and the Plains Indian Wars. 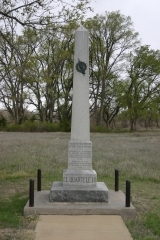 El Cuartelejo is an archeological district consisting of the remains of over 20 archeological sites located within and adjacent to Scott County State Park. Most sites are representative of the Dismal River Aspect of the Plains dating to proto historic/early historic times. The principle site is a seven-room pueblo called El Cuartelejo. Archeologists believe that this is the location of the village of El Cuartelejo referred to in 17th century Spanish reports. El Cuartelejo was the name given to a Plains Apache village in the High Plains where Taos Indians fled in 1664 to escape Spanish rule. Originally excavated in 1898 by S. W. Williston and H. T. Martin of the University of Kansas, the area revealed the remains of stone walls possibly constructed with nearby boulders. Subsequent excavations have revealed other artifacts. The site was nominated for its association with local pre-history and historic settlement. 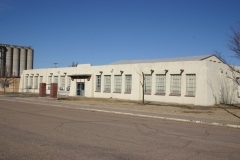 Designed by Mann and Company of Hutchison and constructed in 1939-1942, the Shallow Water School was a Works Project Administration project and designed by the architectural and engineering firm. The school is a one-story, flat roof building with gabled roof over the gymnasium. It is an example of the Mission/Spanish Colonial Revival style with traditional projecting wood posts and piers defining each façade. The walls are constructed of adobe clay block and covered with exterior stucco and interior plaster. 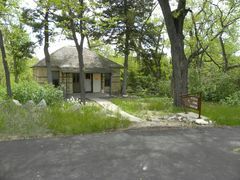 It was nominated as part of the "Historic Public Schools of Kansas" multiple property listing for its architecture and its association with local education. The Herbert & Eliza Steele House is associated with two of Scott County's first Euro-American settlers. Their willingness to share the beauty of their land with the general public led to the creation of Lake Scott State Park; their understanding of the important history within their land paved the way to the discovery of El Cuartelejo and the subsequent National Historic Landmark district. The Steele House is also an excellent example of the Pyramidal Folk house adapted for this site in Western Kansas. Their house and associated springhouse are the only remaining resources associated with the Steele farmstead and are currently used as a museum. Shortly after the Steeles' deaths, the Civilian Conservation Corps improved the Park, adding a pond to the northeast of the house in 1934. The house was nominated for its locat significance in the areas of exploration/settlement and architecture, as well as its association with the Steeles.